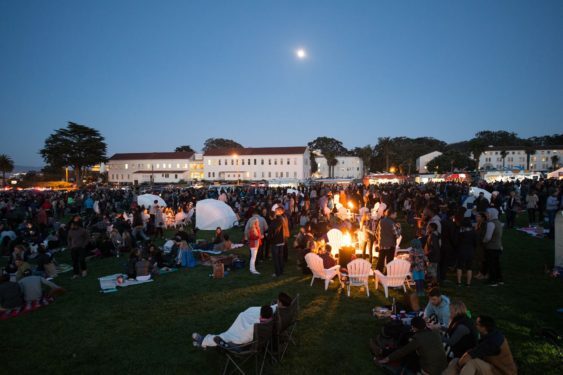 Presidio Twilight is back for its fifth season, and it’s better than ever. This year, San Francisco’s largest campfire features a delicious selection of international cuisine from a stellar lineup of local vendors from 5-9 pm every Thursday from mid-May to September. Off the Grid street food vendors will serve up dishes tapas-style while you relax under the stars on the Presidio’s Main Parade Ground. This event is a great way to kick off your weekend – so grab your blanket, bundle up, and enjoy fire-pits on the lawn, lantern-lit cabanas, yoga at dusk, live music under the stars, and the Presidio’s unbeatable views. Presidio Twilight is located outdoors on the Presidio’s Main Parade Ground, bordered by Montgomery Street and Lincoln Boulevard, across from the Presidio Visitor Center. Twilight can be easily accessed by the MUNI 43 or the free PresidiGo Downtown Shuttle, which offers service between Embarcadero BART, the Transbay Terminal, Union Street/Van Ness Avenue and the Presidio’s Main Post.